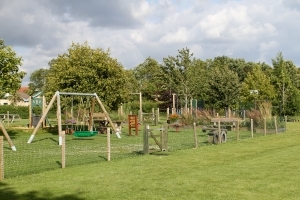 The village enjoys a number of amenities, many of which are located around the village hall area. Our new playground was completed and opened in 2010 following many years of fundraising and planning by the Recreation Association. It features a large number of activities for all ages. Located next to the playground, the tennis court is brand new and has a hard surface. 5-a-side football goals and basketball nets are also available. The new playground was designed to be used by all ages, and a range of adult fitness equipment is located alongside the younger area. 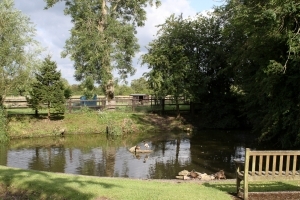 Located near the Ebenezer Chapel, the pretty pond is popular with youngsters. Historically, wooden-wheeled carts needed to have their wheels submerged in water regularly to cause the wood to contract and the wheel to remain tight and firm. The name “Halfpenny” refers to the charge levied for reversing a cart into the pool in order to wet its wheels.